Traditional creative methods employ a variety of approaches to generate breakthrough Ideas. Among the most common are setting aside barriers and constraints in order to allow people to imagine “what could be.” Other methods include games like word associations that are used to push participants to examine a situation from a new viewpoint. Sometimes these traditional creative methods produce the desired results; however, it is more likely that they do little more than waste a lot time producing ideas that do not generate the desired outcomes. There are more effective approaches to creatively solve routine business problems and to achieve breakthrough Ideas. In order to fuel the unique thinking that produces breakthrough Ideas you need to Deviate from your Routines. By Deviating from your routines you will gain blocks of Experience and Knowledge beyond your specialty – the area you Inundate in. Deviating from routines will enable you and your people to envision “what could be” and examine a situation from new viewpoints, while directly addressing the barriers and constraints that are a real part of your world – Why hide the problems you need to address? Further, by Deviating from your routines you will gain blocks that are so unique they act as catalysts to the blocks of Experience and Knowledge that are both existing and newly acquired under the Inundate activity…. The completely unrelated information acts like vinegar tossed on to the baking soda – the Experience and Knowledge of your specialty. 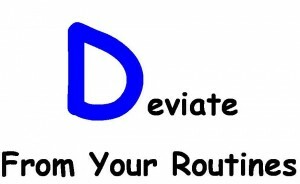 Let’s look at how Deviating from your Routine works as a catalyst in the Ideative process. While walking through a Saigon fish market you smell an orange. The fragrance triggers memories of a fruit stand in California where you stopped during a bike race and that generates Ideas you give to your software team in Baltimore. Deviating from your Routines causes you to learn and experience things that are different. By Breaking Routines Routinely you will learn to take blocks from one field or discipline and use them in other fields to Assemble Ideas. Stop laughing, I am serious. I read it. It was actually interesting. Try it. You’ll learn stuff you’ve never learned before. Become curious. Pay attention to the world around you. Drive down that street you’ve never been down or spend a weekend in a city you wouldn’t normally visit. Establish a job training program so that you and your people spend a week performing in roles you have never before held; the further from your normal roles, the better. Grow your curiosity. Learn, experience, live. Make Deviating From Your Routines a part of your corporate culture. Encourage people to travel to new places, network outside their fields and their industry. Have a team of your people spend a few days acting as consultants to a vendor, a non-profit, or start-up, just for the perspective. Invite guest lecturers to speak on subjects wholly unrelated to your company’s business or business in general or just bring in lunch and play some randomly selected lectures from TEDS. 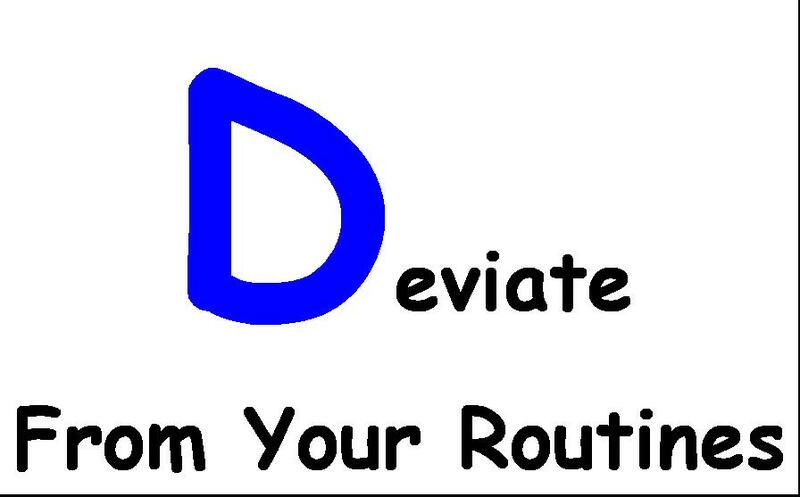 For great suggestions on how to Deviate From Routines, visit: Routinely Break Routines. You will find great suggestions that will activate more regions of your brain by adding unique Experiences and Knowledge.